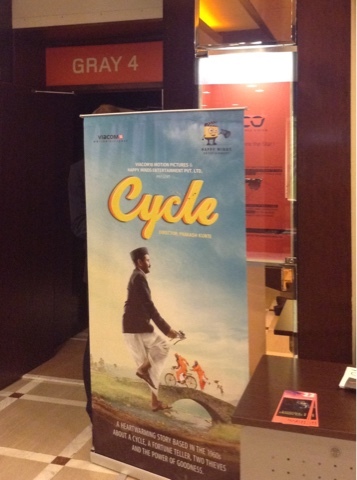 At last, at the half-way point of the festival the much-anticipated lone cycling movie, presented in the Market, was screened in then 32-seat Grey 4 theater this afternoon. There were more empty seats than filled for this warm-hearted tale of a soothsayer and his beloved yellow bicycle that had been his father's. 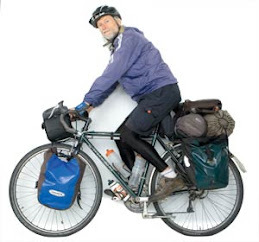 It is a distinctive bike that everyone in the surrounding countryside knows and identifies with him. When it is stolen by a couple of thieves who use it as their getaway vehicle after robbing the wealthiest family in the village, he is devastated. The thieves suffer a flat tire so take it to a bike shop. The repairman knows the bike, so the thieves have to make up a story that they are relatives of the bike's owner and he lent it to them. In rural India in the 1950s phones are a rare commodity, so the owner can't call to verify that, plus he is so trusting of the thieves that he invites them to lunch and then gives them some money to deposit in a bank when they return the bike to its owner's village. They continue on the rough dirt paths that constitute roads having to explain their possession of the bike to others. News travels slowly so no one knows of its theft. It is clear from the gentle tone of the movie that they won't get away with the bike. The only question is how will its owner will regain it. I wished I could have been so confident when my bike was being held hostage by Turkish Air at the Madagascar airport two months ago. A bicycle was also a feature of Volker Schlondorf's "Return to Mantauk" playing in the Market after debuting in Competiton at Berlin this January. Stellan Skarsgard plays a novelist visiting New York from Berlin to promote his novel. His publicist is a young energetic black woman who gets around the city on a bicycle, pushing it along on the sidewalk at times as she ushers Skarsgard to his next appointment. Schlondorf also shows it hanging in her tiny apartment. When Skarsgard visits an old lover there is a bicycle in her penthouse of an apartment. A rental bike flashes by when he leaves her apartment. Schlondorrf was the guest director at Telluride last year. I was hoping the latest from this Palm d'Or winner for "The Tin Drum" would be exemplary enough to make it to Telluride this fall so I could congratulate him on his bike advocacy. This tale of a lusting male pursing a lover from seventeen years ago even as he is visiting his wife who is pursing her career in New York while he remains in Europe wasn't of that level, but it was still worthwhile cinema. "Until the Birds Return" could be a Telluride contender with its sincere portrayal of life in today's Algeria. It is another solid Un Certain Regard film without the perversion or extreme behavior that might have earned it a Competition slot. It is three separate stories that touch upon the struggles and hopes of men and women in the country, including a French woman married to a wealthy Algerian who has had enough of the country and wants to return home. I thought it unlikely I could get into the Market screening of Bruno Demont's "Jeannette" that had earlier played in Director's Fortnight, but there were only twenty others in line when I showed up half an hour early for the screening. There was no rush of those with priority passes or even of us commoners, not even half filling the theater for this oddball musical on the youth of Joan of Arc. It was originally intended for television, but was adapted for a big screen audience as well. It is told in two parts--Joan as an eight year old and then as a sixteen year old. She dances and frolics, doing cartwheels and the splits, and sings as she tends to a herd of sheep. She laments the English occupation of France and fears she must do something about it. More than fifty movies have been done on Joan of Arc, but probably none as fun as this one. As anticipated as the cycling film was the first film in five years from two-time Palm d'Or winner Mkchael Hanake--"Happy Ending" starring Isabelle Hupert. I had to wait until the end of the day to see it, as it had played earlier in the middle time slot at the Lumiere rather than at 8:30 a.m., which I can easily gain entry to. Only two people were in line at eight p.m. two hours ahead of time, so I ducked into an adjoining theater for a taste of a Polish film that was too lackluster to stick with and risk missing Hanake. Half an hour later there were only ten people in line for the 300-seat theater, but I took my place. It was close enough to the entrance I could sit and read the trade papers. Huppert is at the reins of a wealthy family's construction business. She is grooming her son to take over but they both know he will never be able to overcome his incompetence and she'll have to find someone else for the job. Huppert lives in the family's mansion with her 85-year old father, who wants to end his life. After he fails by driving into a tree he tries to enlist the help of first his barber, then his thirteen-year old granddaughter, who has made an attempt of her own. The rather skeletal plot contains other dark, unsettling strands that Hahake jumps to with little connective tissue, more the style of a neophyte than a master. None of Screen's panel of reviewers gave it more than three stars, a fair assessment. The day's other Competition film, "The Killing Of a Sacred Deer" by Yorgos Lanthimos ran the gamut with two four-star reviews and two of zero-stars. Colin Farrell and Nicole Kidman seem to be living a perfect life. They are accomplished physicians, have two young children and live in a dream house. As idyllic as it appears,mthe music of doom that assaults the audience from the outset portends otherwise. Farrell reprimands a teen-aged boy who comes to visit him at the hospital. He is the son of a patient who died on the operating table of Farrell. Farrell seems to have a fatherly relationship with the boy, but we soon learn the boy has not forgiven Farrell for the death of his father and wishes revenge of the eye-for-an-eye sort. The movie descends into horror, making it two hours of agony to sit through despite the great artistry of those making the film.